"What a beautiful piazza, shall we have a drink here?" I asked as we wondered Castelmola exploring the stunning hilltop town. "There's somewhere I must show you, it is a place you'll never forget" G advised. We crossed the piazza, shrouded from the midday sun with musicians playing, people clinking glasses. 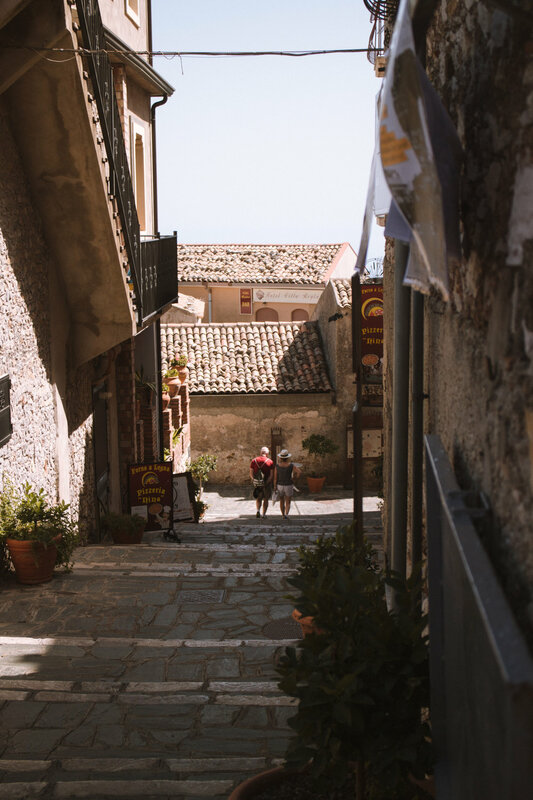 We skirted along little winding alleys, ascending steps. ...and then descending our way down corridors. ...and then up some more steps! Through a small unassuming entrance and into a little entrance hall. There was something intriguing about the tile design. Between the colours, the fascinating design, I couldn't resist sending a photograph to Andrew back home and adding it to our interior inspiration boards. 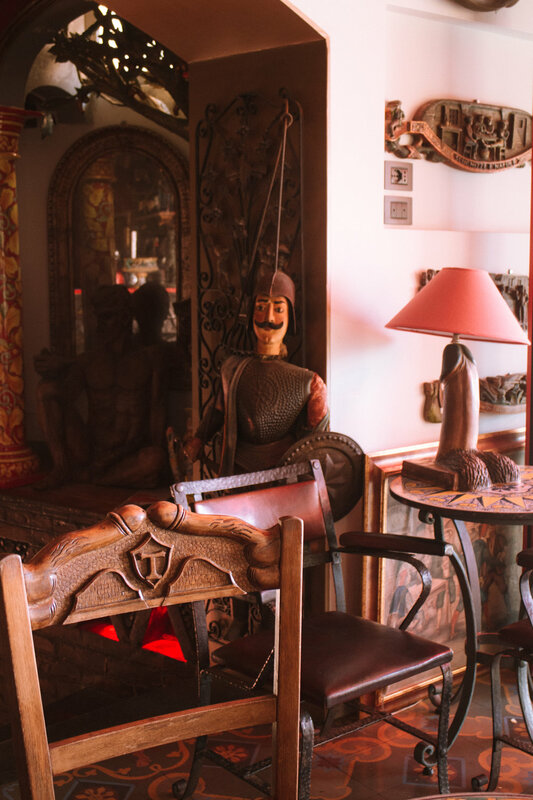 Further into the cool shade of the bar and restaurant, I marvelled at the historical statues and design. Bar Turrisi commissioned beautiful pieces of woodwork with their signature "T" emblem engraved on their pieces of what can only be described as artwork. Even their steel stairs included their signature "T"
The bar staff lead us up three flights of stairs right onto the rooftop balcony. From there we looked out onto the Piazza we started out at a few short steps earlier. From the rooftop the views were particularly special, out onto the bay and along the coast. With it's hilltop position and coastal access, Castelmola is an ancient town which has been strategic in North African, European and Middle Eastern trade links. It has seen significant fights fought over it's territory and been occupied by battle winners who have brought their own cultures and architecture. Now, bare with me, we've all seen roman and greek statues of unclothed men. Anyway, after Greek and Roman rule with their scaled down statue detail, Sicillian residents had enough and as part of a movement against their rule, set out to upscale and embrace once descaled details. 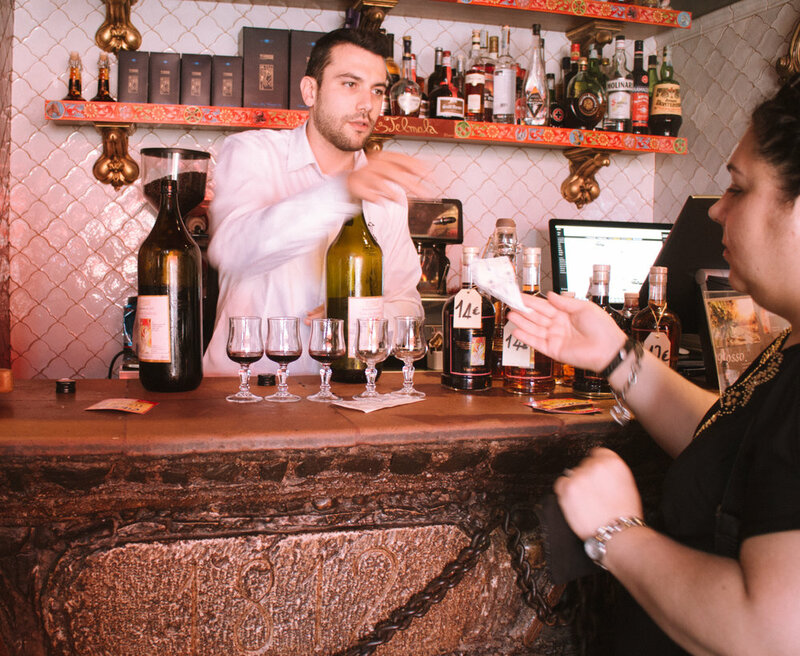 Embracing the cultural and historical significance of Bar Turrisi, we thirstily embraced the menus. I needed coffee to beat the heat, a temperature control habit I picked up living in East Africa all those years back. The lovely Canada joined me with an espresso. We also observed the intricate tiling around the walls. After our coffees and a bite to eat, we giggled our way back down the winding stairs to the barman who poured us tasters of Almond Liquor. He gave us details of a similar bar the the family run in London and we've bookmarked it appropriately for our next adventure. Still giggling, he called to one of the customers who had enjoyed a whole lotta almond wine and asked for a photograph. With eyes filled with tears of stomach rolling laughter, we scattered across seats and finished our drinks. Ahh, G was right, I will never ever forget this bar! We wound our way through to the Venner Bar, my favourite bijoux hideaway on an early evening and a great late night bolthole to decompress with a brimming atmosphere.